RIO DE JANEIRO, BRAZIL – The municipal of Rio de Janeiro have passed a law limiting queues in banks to no more than 15 minutes, and on the days before and after public holidays, 30 minutes. Bank queues in Rio have been famously long, with workers commonly spending their whole lunch hour in the notorious ‘fila’ only to return to the office wearily carrying unpaid bills despite all best intentions. 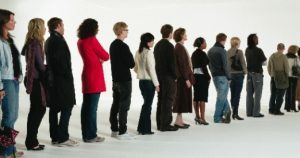 Waiting in line at the bank is now legally limited to 15 minutes in Rio, image provided by stock art. Under this new city law, banks will be forced to introduce measures to keep to this new strict time limit, or else face a fine of R$70,000. Fines can jump to R$160,000 for the fifth complaint that the queue has surpassed the time limit. Banks who repeatedly fail to comply may be faced with forced closure of branches. The Brazilian Federation of Banks (Febraban) will direct banks on the enforcement of the rules, which have until the end of June to enforce the new ruling. However, Livia is unsure what the bank then does with the collected data. Febraban will issue guidance as to this before the June deadline. Mayor Eduardo Paes voted against the bill but the House overturned the veto to pass the law. This law comes at the same time as the introduction of a further law to ban the use of cell phones and radio transmitters in city banks. According to the author of the bill, Dominic Brazão, the ban is an attempt to reduce the number of cases of robbery, called “saidinha de banco” (exiting the bank) where the thief calls an accomplice to rob the customer on exiting the bank. Brazão explained that customers are not banned from entering the bank with their handset, rather the law prohibits only the use once inside the bank. He stated that in Argentina a similar bill reduced this type of crime by 20 percent. 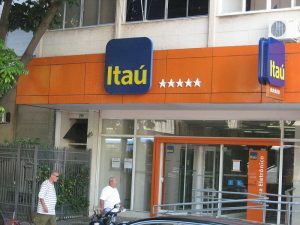 One of the largest banks in Brazil, Banco Itaú, in Leblon, Rio de Janeiro, photo Junius/Wikimedia Creative Commons License. According to the Institute of Public Security (ISP) this type of crime has already fallen in Rio, by 23 percent in the last two years. The Governor of Rio, Sergio Cabral, vetoed the bill but it was passed by the House. It is hoped that the simultaneous shortening of bank queues will reduce the need for customers to use their phones inside the bank. President of the Syndicate of Private Security Companies in Rio, Frederico Crim Câmara is skeptical about the effectiveness of the ban. He claims that most thefts are the result of the thief simply watching customers who withdraw large sums of money, then following them outside the bank to rob the cash, rather than using mobile phones to contact partners in crime. Questions were raised by the technical director Febraban, Wilson Gutierrez, about the monitoring of the new ban since bank officers and security guards have other functions to their jobs defined by federal law and time would be taken away from these duties to monitor mobile phone use. Councilman Fernando Moraes has proposed an additional bill requiring banks to install booths with screens to make it harder for bank transactions to be seen. This proposal is intended as a further measure to reduce cash machine crimes. The state law against cellphones will be one of those that “não pega” meaning no one will pay any attention to it, and there’s no one to enforce it–the security guards, currently on strike, are paid for other functions, there are no bank employees whose job is to hustle people out of the bank, etc. In fact the main use of cellphones is by people trying to make some transactions and have a number slightly wrong, so they call up while at the teller to find out the correct number. The municipal law about queues of 15 minutes is a make-work project for the bankworkers union, because all most banks have to do to cut down the queues is put more tellers to work. And almost any banking business you do at a teller window you can now do over the internet, or at lotteries. Dumb law. I’ve seen one or two people using cellphones in banks here in São Paulo. I’ve also seen those people told to either put them away or leave.